Seminars: Available for large groups of young children. These provide a great introductory experience for beginning riders. Call for details. Private Lessons:Evaluates the rider’s ability. One-on-one instruction on any style of riding — $60 per hour. Summer Day Camps: 2 day programs: Fun for kids ages 7-17, beginner to advanced. Strictly a horse lover’s camp. Covers all aspects of riding and care. Boarding:Full care starting at $375.00 a month. 10 Hour Riding Pass: Good for families and individuals. Cost: $275.00. 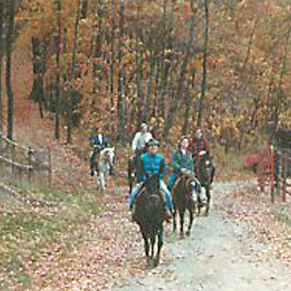 The riding pass includes lessons covering defensive riding skills on an obstalcle course, an outdoor riding track, a round pen and our trail course.